Cleaning your area rugs regularly will extend the life of your fine fabrics and keep them looking their best all year round. Our New York Rug Cleaning facility is the perfect place to go for all types of area rugs in need of a cleaning. Rugs in New York City are much more susceptible to getting dirty and carrying harmful allergens than anywhere else in the world. Did you know that rugs in NYC carry up to 37% more airborne pollutants which become trapped deep in the pile of the rugs? Our Rug Cleaning New York facility will flush out any toxins, allergens, odors, bacteria and dust that has been trapped within the fibers. Regular vacuuming is great and should be done as often as possible, however a deep cleaning of your area rugs should be done once every 12-18 months depending on the level of traffic. A standard 8×10 wool area rug can hide up to 10 pounds of dust before it even begins to look dirty! At rug cleaning new York, we regularly clean exotic rugs, Persian Rugs, Oriental Rugs, machine made rugs, shag rugs, FloKati Rugs, Kilims, and everything in between. Based on the type of rug that you have, our rug cleaning techniques will ensure that your rugs are being cleaned to the safest and best of all standards. Upon arriving on time within the window you have scheduled with us, our technicians will provide you with an in depth inspection on your rug. They will identify the material, determine what the best cleaning process will be for your particular rug , take measurements, and provide you with an estimate. During this time, your rug will also be examined for any pre-existing damage, loose fibers, stains, or color runs. If you are satisfied with your quote, the technicians can move any furniture and get the rug rolled up and taken back to our facility to begin the cleaning process. Using our state of the art dusting equipment, we thoroughly yet gently remove any dust trapped deep within the pile of the rug. Often times we can remove pounds of dust just by this process alone. The results can be shocking. This important step is one that many rug cleaners overlook. Wetting the rug before removing all the dust can lead to several issues such as severe staining, odor problems, and stiff fibers. We test the rug for colorfastness and Ph level. 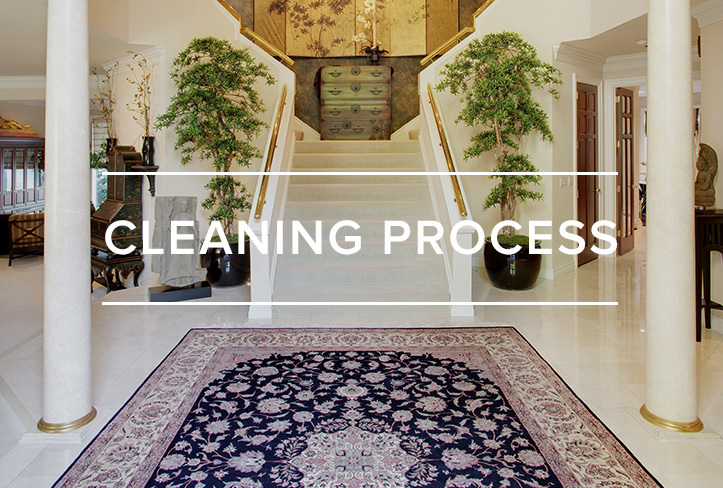 This ensures that we will use the proper products and cleaning methods for the area rug. After we pre-treat any areas that may pose as issues. The rug is ready for a bath. Our custom fit rug pools will thoroughly soak both sides of your area rug providing for a deep cleaning. Using modern day technology and old style knowledge we are able to recreate a similar constant flow of water you would normally find in a river. By fully submerging the rugs in water we are able to remove any remaining deeply embedded soil, grime, odors and pet urine. After the rug has been thoroughly soaked and scrubbed by hand we provide a pure water only rinse which ensures that all cleaning agents have been rinsed out of your rug and it is left in its natural state. This neutralizing process also ensures that any possible leftover soil will now be gone. Depending on the type of rug you have, rugs will either be hung up to dry or laid down flat to dry in our temperature controlled rooms. The drying process is an important step. Proper dry times are necessary to ensure that odor issues do not become a problem. After the rug is fully dry, it is time for a proper groom. Using our area rug pile lifters, the nap on your rugs will be beautifully restored to its original soft and plush texture. At this time your rugs fringes will also be cleaned. We take extra care with delicate fringes to ensure that they maintain their structural integrity. Cleaning of the fringes is always done by hand with soft horse hair brushes. As a final step, we give your rug one final inspection to make sure everything looks perfect. Once it is determined that the rug is complete, we will package it and call to schedule a delivery time. We also offer optional fiber protectors and moth proofing treatments which can be applied post-cleaning to ensure the safety and longevity of your fine possessions. Upon delivery, our technicians will unroll the area rug and place it back down wherever you’d like it. Leaving you with the cleanest, healthiest area rug you can have! Of course, all of our work is 100% guaranteed.